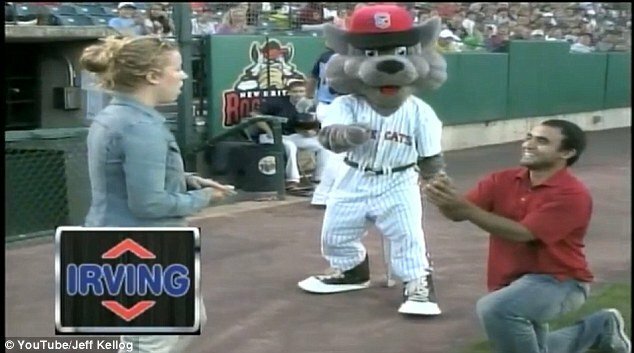 Home Tags Posts tagged with "new britain rock cats"
David was thrown a curve ball after asking his girlfriend Jessica to marry him at a New Britain Rock Cats minor league game in Connecticut last week. And judging by his reaction, it seems the brave Lothario wasn’t prepared for the outcome. The couple were on the field answering questions when the announcer passed the microphone to David. “Will you marry me Jessica?” he asked. The rejected suitor turned as red as his T-shirt as he ran out of the stadium, with the mascot still dancing around the field. The Big Lead speculates the proposal could simply be a hoax, but the Huffington Post reckons the “woman’s off-microphone reaction seems pretty real”.